Shopping for a new GMC Yukon? Measure your garage first—the long-wheelbase 2018 GMC Yukon XL is one of the biggest vehicles you can buy today and it may not fit. The 2018 GMC Yukon is a full-size SUV that uses traditional body-on-frame construction, but it hardly feels dated. The 2018 Yukon is offered in SLE, SLT, and Denali trim levels. None is basic, but the Denali is nearly as luxurious as the related Cadillac Escalade. 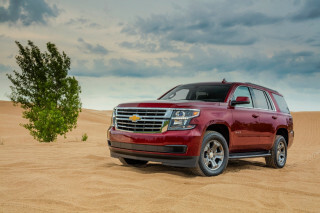 Chevrolet also sells a version of this basic vehicle as the Tahoe (short-wheelbase) and Suburban (long-wheelbase). Shop both, since the Chevy is usually a few bucks cheaper than the GMC. This year, the Yukon Denali gains a sophisticated 10-speed automatic transmission, a slightly revised look (you’ll really have to squint to see the differences), and an Ultimate Package that bundles most options. The standard Yukon and Yukon XL are largely unchanged. Yukons are offered with rear- or four-wheel drive and a choice of a 355-horsepower 5.3-liter V-8 or a 420-hp 6.2-liter V-8 that’s exclusive to the Yukon Denali. A 6-speed automatic is included with the smaller V-8, while the 6.2-liter makes use of a new 10-speed. 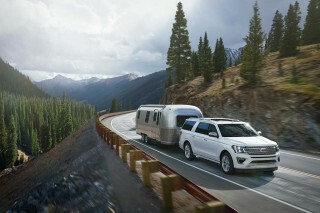 The Yukon’s separate ladder frame and beefy solid rear axle endow a properly equipped variant to tow up to 8,500 pounds. The 5.3-liter V-8 provides more than adequate acceleration and returns surprisingly good fuel economy; the bigger V-8 flips those attributes with a robust feel and the downside being on a first-name basis with your local Texaco. Inside, the Yukon benefits from a car-like dashboard and a high-quality feel throughout—as it should at a base price of around $50,000. The Yukon—along with its Chevy twins—is the last SUV to offer a three-place bench seat up front, but few dealers stock this configuration. Instead, two overstuffed bucket seats and a center console give front seat passengers a commanding view out. 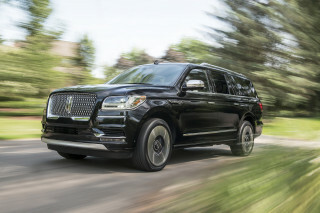 The second row’s not quite as roomy, and row three ranges from surprisingly tight with the standard wheelbase to adult-friendly in Yukon XLs. With the third row upright, Yukons have precious little cargo space, but Yukon XLs can store several suitcases. The third row folds flat, but the cargo floor is oddly high off the ground thanks to the old-school solid rear axle tucked underneath. 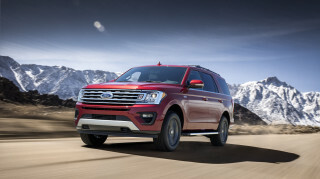 Rivals like the Ford Expedition have a lower load floor. In addition to the expected airbags, anti-lock brakes, and stability control system, a bucket seat-equipped Yukon includes a front-center airbag designed to prevent the driver and passenger from bumping noggins in a wreck. Adaptive cruise control and automatic emergency braking are available, as are blind-spot monitors, lane-departure warnings, and front parking sensors. All Yukons feature an 8.0-inch touchscreen infotainment system with standard Apple CarPlay and Android Auto. The system is easy to sort through at quick glance and can be upgraded with a baked-in navigation system for not too much extra. Yukon SLE and SLT trim levels essentially look the same, aside from several wheel designs on the options list. They’re not shy about their boxiness, but GMC has largely eliminated unnecessary curves and flair without imparting a downscale feel. Even the most basic Yukon SLE has a big-buck look, which is something we can’t say about an entry-level Chevy Tahoe. The swept-back headlights work well with the Yukon’s boxy grille. At the rear, the Yukon is simple and squared off with big LED taillights. The Yukon Denali stands out from the pack with its own wheel design and a lot more chrome. We think it verges on tacky, but the market seems to disagree—GMC says about three-quarters of all Yukons sold at the retail level are Denalis. Inside, GMC takes a different approach with the Yukon’s symmetrical dash layout. It’s curvy and almost voluptuous. High on the center stack sits an 8.0-inch touchscreen and controls are logically arrayed below. The look is a bit outsized, but that fits with the Yukon’s trucky demeanor. Yukon Denalis are a little dressier with nicer leather, more stitched surfaces, and different fake wood trim, but they follow the same basic theme. Most 2018 Yukon SLE and SLT trim levels include a 5.3-liter V-8 engine rated at 355 horsepower and 383 pound-feet of torque. A 6-speed automatic transmission sends power either to the rear wheels or, optionally, all four. The Yukon’s standard V-8 is characterized by a refined, muffled demeanor. Yukon Denalis substitute a 10-speed automatic and a 6.2-liter V-8 rated at 420 hp and 460 lb-ft.
To save fuel, both engines can transparently run on four cylinders in light-load situations; only a small notation on the instrument cluster indicates when this is happening. There’s ample power with either engine for most needs, even with a trailer attached. Interestingly, the highest-rated Yukon for towing is the rear-wheel drive, standard wheelbase model at 8,500 pounds. The more powerful Yukon Denali checks in a few hundred pounds less. 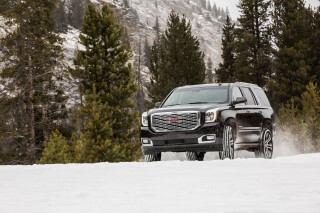 Unladen, the Denali is remarkably fast for a vehicle that tips the scales at around 5,500 pounds. However, that weight makes itself known on a curvy road. Remember that this is an SUV and you’ll find the Yukon lineup to be well-balanced with accurate, direct steering and not too much lean into corners. Yukon SLE and SLT trim levels ride the best with their tall sidewalls, but the Denali counteracts its tall wheels with magnetically controlled shocks. This setup filters out small bumps for a more luxurious feel and stiffens up a touch in the corners. Given the Yukon’s size, it’s not really an off-roader in any configuration. But for those who find themselves on a dirt road, the optional four-wheel drive system includes a low-range useful for more serious trail-duty or for tugging a boat out of the water. Skid plates are optional. The 2018 GMC Yukon has a high-end feel, its seats are comfortable, and it can haul a heck of a lot of cargo. Most Yukons have bucket seats up front with a wide center console. Cloth is standard, while the leather on SLT and Denali trims is nicely grained and available in several attractive shades. Row two is comfortable for two and wide enough for a third in a pinch. The Yukon’s third row is best for kids in the standard wheelbase, but the full Yukon XL has decent stretch-out room with lots of cargo space behind. Fold the Yukon’s second and third rows flat and you’ll wind up with nearly 95 cubic feet of space. The Yukon XL’s maximum cargo-carrying capacity is an impressive 121 cubic feet. It’s not arranged for big item-shuffling as well as, say, a minivan, however. Small item storage is a real boon with plenty of places to tuck away drinks, cellphones, notepads, and the like at every position. Even at the entry level, the Yukon has soft-touch materials scattered about and nice stitched surfaces on the dashboard and door panels. The same is true for SLT and Denalis, which is fine—except that a loaded-up Denali runs about $80,000. For that kind of cash, we think it should feel a little more special than the rest of the lineup inside. All Yukons include a full complement of airbags, stability control, and traction control. Yukons with bucket front seats—that is, the vast majority of them—have an innovative airbag integrated into the right-side bolster of the driver’s seat. This airbag is designed to prevent the driver and front passenger from bopping heads in the event of a collision. 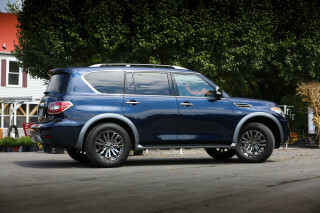 Optional on Yukon SLE trims and standard otherwise is low-speed automatic emergency braking. Full-speed automatic emergency braking is paired with adaptive cruise control, where it’s optional on Yukon SLT and Denali trim levels. Active lane control, automatic high-beam headlights, and power-adjustable pedals are also exclusive to SLT and Denalis. The federal government rates all versions of the Yukon at four stars overall, albeit with five stars in frontal and side-impact tests. How do they get to just four stars? In the rollover measurement, which is calculated rather than actually tested, these top-heavy SUVs rate just three stars. The IIHS hasn’t tested the Yukon yet, but we’ll update this space if that changes. No version of the 2018 GMC Yukon is sparsely equipped, while Yukon Denalis teeter on luxury-grade (with a price tag to match). We’ve given the lineup points for their terrific infotainment systems, their high level of standard equipment, and for their myriad options. 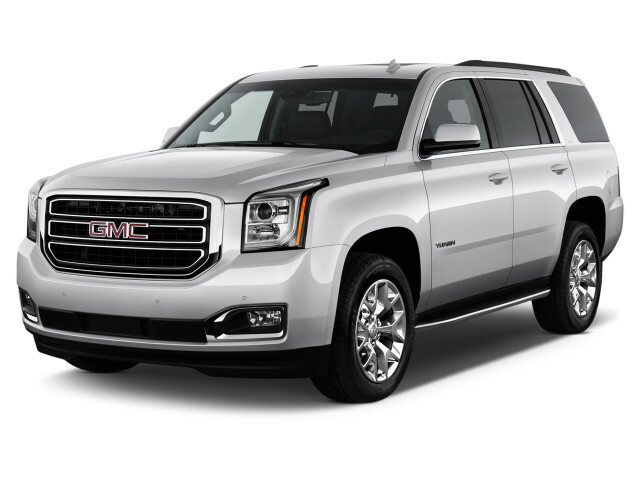 GMC makes ordering a Yukon fairly easy—both the standard wheelbase and Yukon XL versions mirror one another in terms of standard and optional equipment. The Yukon range starts with the SLE trim level, which is the only variant fitted with cloth upholstery. You’ll have a choice of a three-position front bench or two buckets with a big center console. A rearview camera, three rows of seats, 18-inch wheels, and an 8.0-inch infotainment system with standard Apple CarPlay and Android Auto are all standard—as they should be at a price hovering around $50,000. A few niceties are also included like Bose audio, automatic wipers, and automatic three-zone climate control. 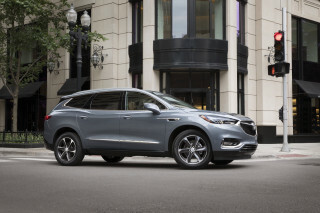 Option packages can add features like baked-in navigation and a power liftgate, plus the Enhanced Driver Alert group that adds automatic emergency braking, forward collision warnings, active lane control, and automatic high-beam headlights. But once you’ve loaded up an SLE, the Yukon SLT isn’t much pricier. It adds leather upholstery, heated front and second-row seats, and ventilated seats up front, plus a heated steering wheel, keyless ignition, and power-folding second and third rows. Given how well-equipped the SLT is, options are limited to full-speed automatic emergency braking, a rear-seat entertainment system, navigation, and a moonroof. You won’t find too many options on the Yukon Denali, but a new-for-2018 Ultimate package adds power-retractable side steps, 22-inch alloy wheels, adaptive cruise control, and a moonroof. The 2018 GMC Yukon and Yukon XL are big SUVs, but they’re more fuel-efficient than their size might suggest. 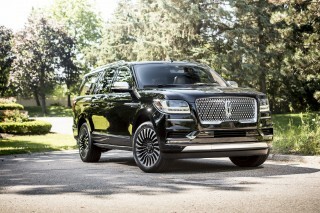 Rear-wheel drive 2018 Yukons and Yukon XLs are a bit thriftier than their siblings: 16 mpg city, 23 highway, 19 combined with the 5.3-liter V-8 and 6-speed automatic. Opting for four-wheel drive pushes those figures down to a still respectable 16/22/18 mpg. The 2018 Yukon Denali’s 6.2-liter V-8 when fitted with rear-wheel drive and a 10-speed automatic comes in at 14/23/17 mpg regardless of wheelbase. Four-wheel drive Yukon Denalis fare slightly differently: 14/22/17 mpg for the short wheelbase and 14/21/16 mpg for the Yukon XL Denali. Looking for a different year of the GMC Yukon?